On purpose, I've been avoiding the cookie aisle at the grocery. I just don't need that kind of food in the house. It's a path of least resistance, when it comes to meals. I may not be very hungry and there's a box of cookies over yonder and, well, that becomes supper. Not a good choice. But I found myself craving cookies when friends and my news feed announced it was Girl Scout Cookie time. It's almost impossible to resist the allure of cookies during that time of year. Because I don't know any Girl Scouts, the grocery basket turned, on its own, I swear, down the cookie aisle at Mariano's. Over the course of two months, I tried three different Oreo flavors. First up was Red Velvet. Because this is not a part of my family heritage, I'm not completely sure of the attraction of this flavor. Perhaps, because I've not had the real thing, I don't know of the red velvet flavor I've seen in all sorts of products is correct. Steak 'n Shake had a red velvet shake I liked, but I've been little unimpressed with any other red velvet infused offerings. I pulled open the package and, well, they are red. The cookie part was bland. I don't know know whether that is intentional. 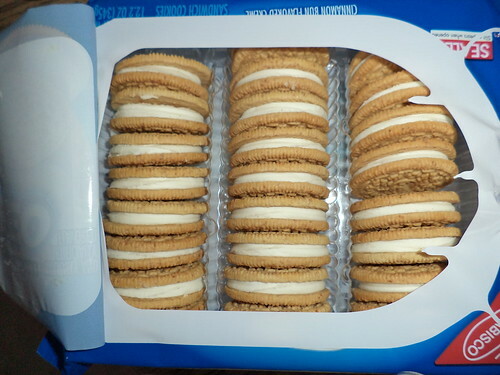 The creme filling was not the usual Oreo flavor. It was more "creamy" tasting, not as sugary. 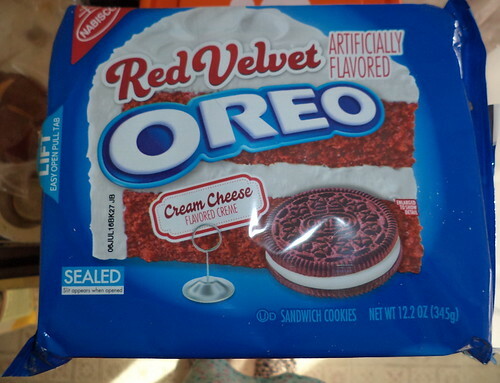 These were okay, but unless you are trying anything with red velvet flavor on the package front, not worth the money. Also not worth the money was this flavor. I wasn't sure what to expect from this flavor. Is there anything to visually recommend this flavor? No. Remove the logo stamped on the cookie and I've seen this kind of thing for decades in the cookie aisle. It's a cinnamon cookie. Wow. With Oreo creme in the middle. Meh. The creme filling was a bit different in flavor, more akin to the glaze on a cinnamon roll. You could do the same thing, perhaps improve the cookie, by make sandwich cookies out of snickerdoodles and vanilla frosting. Save your money. 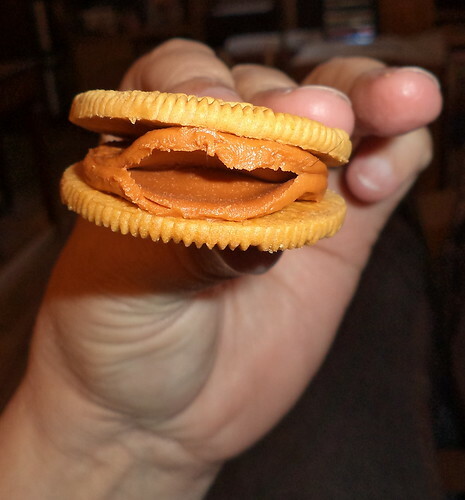 Finally, I tried the pumpkin filling Oreos. I thought I'd taken a photo of the bag and the cookies but all I have is this. The cookie part was lightly gingerbread flavored. The filling had a distinct pumpkin taste but with a creamy texture. 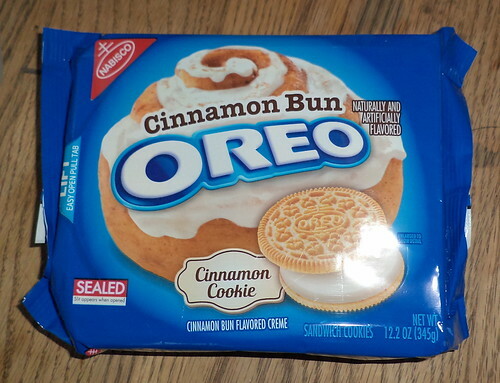 It was okay; more appealing from an Oreo standpoint than the previous two bags I'd tried. The thing I found most humorous was how the creme filling separated to look like a mouth when I'd take the cookie apart to eat it. Here's the thing with these "exotic" flavors. 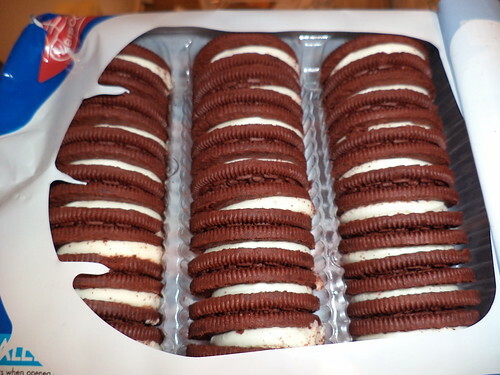 The whole point of a bag of Oreos is to dunk the cookies in milk. Either you dunk the whole thing or you take it apart and just dunk the cookie. I can't, for the life of me, fathom dunking any of these cookies in milk. I wouldn't. I realize there is a growing market for "niche" flavors; those unique pairings only available for a limited time. But, as I've pointed out with M&Ms, not every flavor available needs to be in your product, even for a limited time. Out of all of these, the pumpkin version was, to my surprise, the least offensive. I still wouldn't bother spending your money on any of these versions. Buy the regular Oreos. Get a glass of ice cold milk. Now that spring has arrived in the northern hemisphere, take your milk and a stack of Oreos onto the deck and watch winter leave. Consider all the calcium and Vitamin D you're getting. Yup, I can help you justify those 10 cookies.